Angelonia is a lesser known (some would say unknown) plant that provides long lasting blue flowers and green leaves throughout summer. We have no doubt that this scarf will be a long lasting favourite - although even more rare than angelonia. 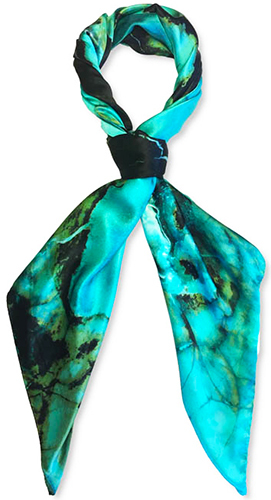 It features a lovely range of turquoise green and blue tones typical of jasper, a gemstone formed under huge temperatures during volcanic activity, yet managing to look tranquil and somewhat plant-like here. This scarf, though, is found only in luxury stores like Fortnum & Mason - and here.